A Mexican journalist has been shot dead while attending a Christmas celebration at his son's primary school. 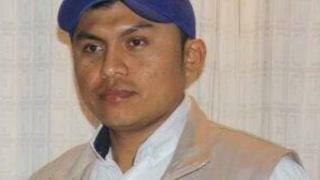 Gumaro Pérez Aguilando, 35, was killed on Tuesday in Acayucan in Veracruz state. He was a founder of news site La Voz del Sur and had been under state protection because of the high risks of reporting on crime. The state security coordinator said that dozens of parents and children were present when he was killed. Veracruz is considered one of the most dangerous places in the country for reporters. At least ten journalists have been killed in the country this year, according to press freedom organisations. The Veracruz State Commission for Care and Protection of Journalists (CEAPP) said Pérez had been part of their programme since 2015 but had not made them aware of any specific threats received recently. Pérez was an employee of the city council, according to local media. His widow, Adelina Mendoza, told local news outlet E-Consulta Veracruz that she thanked God that their six-year-old son did not witness the killing as he was in a classroom at the time. She said she had been encouraging her partner to leave journalism and open a family restaurant business. "His mother cooks really well and the idea was to leave [reporting] and we would be able to relax," she said. State governor Miguel Angel Yunes said he has ordered police protection for Pérez's family. The US Ambassador to Mexico Roberta Jacobson wrote on Twitter that she was outraged by the death. "The truth cannot be killed by killing journalists," she said.